Context-clicking an EditorWindow tab shows the context menu for that window. The standard context menu has the items: Maximize, Close Tab, and Add Tab. 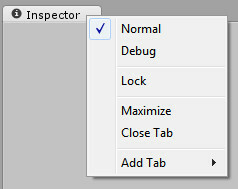 Some of the built-in windows have extra items in their context menus, such as the Inspector which also has: Normal, Debug, and Lock. 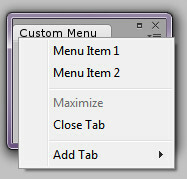 I’m going to show you how to add your own custom menu items to your window’s context menu. It’s really simple. You just have to implement the IHasCustomMenu interface like so. The method of note is AddItemsToMenu(GenericMenu menu). Inside the method body, add the menu items you need in order from top to bottom. If you need to, take a moment to read up on GenericMenu. 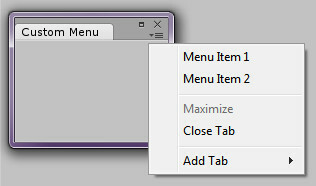 Context-clicking the window’s tab will show the menu as will clicking the little icon on the right over there. If an item should be checked, just pass a value of true to menu.AddItem() as the on parameter. See Menu Item 2 in the example. Thanks! This came in very handy.